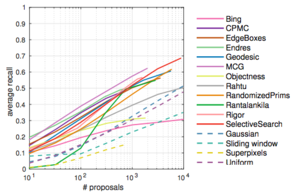 Max-Planck-Institut für Informatik: What makes for effective detection proposals? Departments Computer Vision and Multimodal Computing Research Object Recognition and Scene Understanding What makes for effective detection proposals? J. Hosang, R. Benenson, P. Dollár, and B. Schiele. 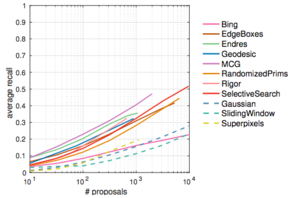 What makes for effective detection proposals? PAMI 2015. J. Hosang, R. Benenson, and B. Schiele. 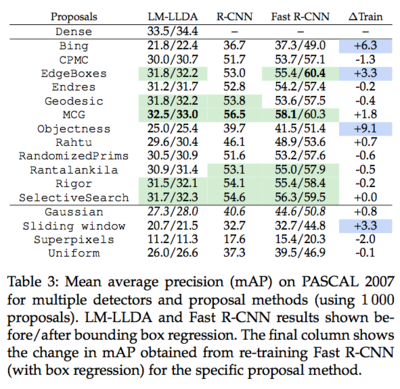 How good are detection proposals, really? BMVC 2014. 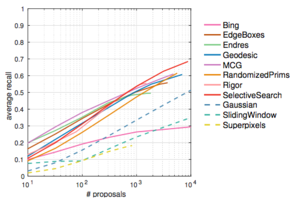 For three different detection proposal methods, the picture show the four best localized proposals, i.e. closest to the ground truth. The methods are: Selective Search (red), BING (blue), Random Gaussian (green). I'm in the process of preparing data and code for release. You can find everything that is available so far below. Please let me know if you're missing something! 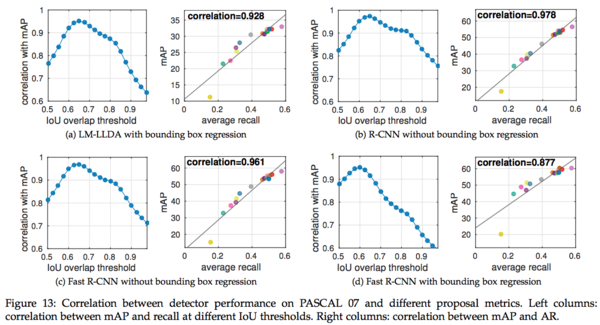 For the recall experiments (see Section 4 in the paper), we run twelve detection proposal methods and four baseline methods over the pascal test set. We also do recall experiments on ImageNet (see Section 4 in the paper). Data from the recall experiments on COCO (see Section 4 in the paper). For repeatability experiments (see Section 3 in the paper), we applied a number of perturbations to the pascal test set. Figure 1: Average recall on the PASCAL VOC 2007 test set. Figure 2: Average recall on the ImageNet 2013 validation set. Figure 3: Average recall on the COCO 2014 validation set.